is back! Beautiful Sunday, perfect weather, buying 12 pack of Blue Moon beer and heading to Caldwell Woods Park for first Cyclocross race this season. My category (3) start at 12, so get there around 11 to find George Garner Cyclery tent and said hello to Tony. Of course hundreds of people are already there, cheer friends from different cats and joining great Sunday. It is good time to meet old friends from track in Northbrook, criteriums or group rides all around Chicago, said hello to every one and ask “how are your legs today?”. Waiting for my good friend John who is racing second time this season after 2 years break. He and his girlfriend bring the best cookies ever! to make ours day even more awesome! But is it time for my racing staging in 3rd lane next to Piotr (Piter) Wiktorczyk, second Polish guy in entire Chicago Cross Cup series (I never meet third). Perfectly focus waiting for whistle, and here we go every one is pushing all he got. They close in the beginning losing few position but still fighting. This year I race 45 min in cat 3 compare to 30 min in cat 4 what’s give us 5 laps of good racing. It is hard to handle all turns bumps etc. after whole year on track and road, but trying my best and chasing guys in front of me, my legs doesn’t fill super light but always giving 100% losing second on technical parts so mostly at all course for me and doing few bigger mistakes like uncliping on short uphill. finishing o 20th position and getting good lesson. Cat 3 guys are definitely strong and my goal for this year is get to top 10 working on my technique and doing more cross workouts. This is just begging of the day! Now it is time for beer and relax watching other racing as hard as possible. 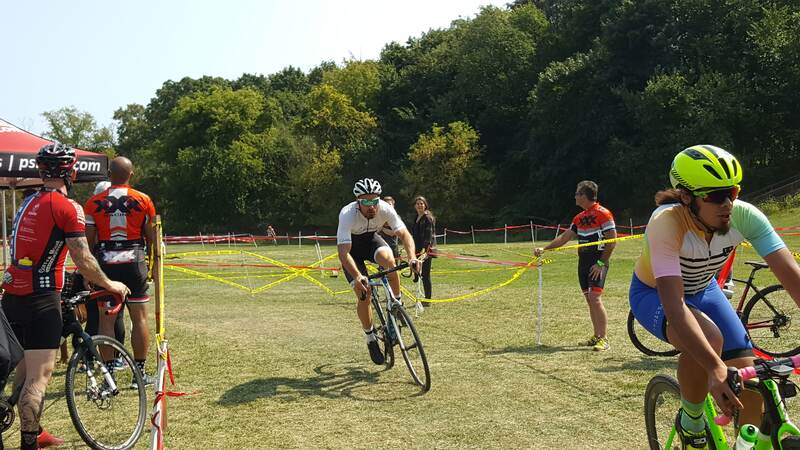 The best part of the day is Sven Nys racing cat 4/5 and showing unreal cross skills! That what you hear and see on this video is how every Cyclocross race looks like adding more beer and donuts :). After all I did sign up for great clinic with Sven Nys (check here) which gave me great overlook for all I suppose to do to be faster in Cyclocross. Now it is time to bring it into life and practicing those new skills. Thank you everyone for cheering me and hope to see you on Chicago Cross Cup #2.